How did the religion become so apparently prevalent in South Korea? South Korea is awash with evangelical Christianity. This once resolutely shamanistic and Confucian country now seems to have more churches than corner stores. From miniscule, storefront chapels to the biggest church in the world, the skyline of every major city is ablaze with neon crosses. Evangelical Christians proselyte house to house, distribute pamphlets and church-emblazoned tissue packets on street corners, and cycle through town blaring sermons and homilies through bullhorns, urging you to either accept Jesus, or be prepared for the Devil’s wrath below. It is very rare to spend more than a few days in Korea without being preached to. “We think of Korea as the Second Jerusalem,” says Hong Su Myeon, an older volunteer at Somang Presbyterian, a megachurch in Gangnam. He says Korea is leading a wave of evangelization around the world. What can be most surprising to a visitor to Korea is that only 29 percent of the population actually identifies as Christian – about three-quarters Protestant, one quarter Catholic. But their zeal is so enormous that it overshadows the 23 percent who are Buddhist, and the 46 percent who say they have no religion at all. 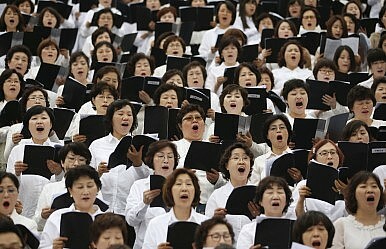 It is one of East Asia’s greatest historical riddles – how did this small, divided country go from being a place where Christianity was just a footnote – barely one percent of the population in 1900 – to one that produces more missionaries than any other country in the world, bar the U.S.
No one would have predicted Christianity’s success in Korea 200 years ago. Catholicism was first introduced in the 18th century by returning Confucian scholars from China, but they saw it more as an academic interest. It was the direct arrival of French and Chinese Catholic missionaries in the early 19th century that set off the first round of missionizing. But Korea’s rulers were having none of it. “For its first 75 years [the Catholic church] underwent the most horrendous persecution, comparable really to the history of the early church,” says Dr. James Grayson, professor of Modern Korean Studies at the University of Sheffield. Murder, torture, and massacre were all directed at early Christians by the Joseon Kings, who saw the church’s teachings of equality before God as a direct threat to their power. At least 8000 Catholics were killed, and many have since been canonized, giving Korea the fourth largest number of saints of any nation. In 1984, John Paul II canonized 103 all at once. It was the arrival of Protestantism in the 19th century that changed everything. By this point the Joseon kings were fast losing power, their Chinese protectors were in decline, and an ascendant Japan, America and Russia were all eyeing the Korean peninsula. The country needed whatever grace God could give it. Protestantism arrived mostly from American missionaries, like Horace Allen and the Underwood family (famous for their typewriters), who built the schools, hospitals, and universities the kings didn’t. Christians were reputed to treat peasants with respect, as opposed to the scorn poured on them by the traditional nobility. The Bible was translated into Hangul, the simple phonetic writing system, rather than only into Chinese characters, which most people couldn’t read. Christianity became a source of resistance, especially to Japanese colonial rule, which began in 1910 and was famously brutal. Though not all churches were anti-Japanese, many were. When the Japanese left in 1945, the church was in high standing. The first South Korean president, Syngman Rhee, was a U.S.-educated Protestant. Even Kim Il-sung, first ruler of North Korea, had been a Presbyterian as a child. Following the Korean War, South Koreans came to view the Americans as saviors, and the Americans’ religion, Christianity, as a source of strength and wealth. Protestant leaders in South Korea “became very much familiar with the so-called American-style Protestant religion, sort of an American religion,” says Dr. Song Jae-Ryong, professor of Sociology at Kyunghee University, and President of the Korean Association for the Sociology of Religion. They adapted American evangelical themes and worked hard at turning South Korea into a Christian nation. The 1950s through 1980s saw South Korea governed by a series of murderous strongmen and generals. Some were Christian, some weren’t, but all were fanatical anticommunists, which proved nicely compatible with evangelical Protestantism. Many Christian preachers were from the north – Pyongyang had been a hotbed of Christianity before the Korean War – and when they fled south they brought with them a virulent hatred of communism. Conservative, evangelical Christianity meshed well with the authoritarian, development-minded dictatorships, and the two forces reinforced each other. Evangelization spread with development. The new factories often had chaplains, as did the military, which required three years of service from every young male Korean. The dislocation caused by rapid industrialization sent many Koreans scrambling for something to believe in. “If society changes very quickly on a large scale, some people soon become left behind, and those people have some emotional, and psychological feelings of deprivation,” says Song. As a result, they will often attend church, maybe one they learned about at work, or from a pamphleteer on the street. Many people had also left their villages for the big city, and found themselves alone and in need of a social group, in a culture where social groups are extremely important to identity. In many cases, the bigger the social group, the better. The most successful evangelist by far was Cho Yong-gi, also known as Paul or David Cho. In the late 1950s he founded Yoido Full Gospel Church, with, as he loves to boast, only six members. Now it’s the largest church in the world, with over 830,000 congregants. It takes up an entire river-front block in central Seoul, and is worth untold millions of dollars. There are dozens of other megachurches in Korea – Somang Presbyterian, Nambu Full Gospel, Assembly of God Grace And Truth, Myungsung Presbyterian, Kum Ran Methodist, Young Nak Presbyterian, Soong Eui Methodist – all of them with more than 40,000 worshippers every Sunday, some well in excess of 100,000. He also says there is often less pressure to be devout in a large church, because you are so anonymous. Many pastors have been eager to emulate Cho’s success with Yoido Full Gospel. Christianity has always equalled wealth in Korea, but in Cho’s case, it has equalled quite a bit of it. In 2014, Cho was convicted of embezzling $12 million in church funds, receiving a fine and a suspended sentence, though his son went to prison. The church was torn apart as elder attacked elder (sometimes physically) and accusations grew that $12 million was only the tip of the iceberg, and that Cho and his family had secreted away as much as $500 million. Throughout Korea, stories of the lavish, usually tax-free lifestyles of Protestant leaders have caused almost universal mistrust of the churches by non-Christians, and many Christians themselves are fed up with what they perceive to be widespread corruption behind the pulpit. A 2015 poll found that only 20 percent of Koreans generally trust Protestant pastors. “The ideology of the Christian religion, or Protestantism, is usually a poor Christian is not a Christian,” says Song. There is a pervasive belief, influenced by shamanism, that God wants you to be rich, and wants the Korean nation to be rich. Most Christians attribute South Korea’s rapid rise to prosperity to God’s work. In the present as in the past, Koreans will visit shamans, people who can reputedly speak to the spirits around you, not for care in the afterlife, but for good fortune now: for the success of a business, the healing of an ailment, a perfect score on a child’s exam. This shamanism has infused itself into Korean Christianity, where Koreans will pray for day to day health, wealth, and happiness, and Christian ministers will work to guarantee it. “There’s always been this basic belief that the priest, namely the shaman, or in Christianity the minister, has this tremendous […] access to the gods, or God,” says Hwang. Cho, like many Christian ministers and most shamans, claims to be able to heal people spiritually of real medical ailments, notably paralysis. (“And he walks!”) The end of each service at Yoido involves the minister going through a long list of medical conditions, demanding they be gone. Protestant services are rarely subdued in Korea, with people falling into trances, speaking in tongues, and loudly proclaiming their allegiance to God – in hopes they will reap the benefits not just in the next life, but in this one too. But the appeal of evangelical Protestantism appears to have hit a wall. Attendance rates, and the number of Koreans claiming to be Protestants, have stalled. The democratization movement caused many young Koreans to resent the largely conservative, pro-regime roles most churches held. Corruption, internecine battles within the churches, and a singular focus on growth at all costs have also hurt church attendance. By contrast, the Catholic Church has continued to grow, largely because it is perceived as being progressive, anti-regime, above corruption, and more democratic, ironic as that might sound to reform-minded Westerners. Kim Dae-jung, a well-known dissident during the dictatorships who would later go on to become president and win the Nobel Peace Prize, was Catholic. Though there was a “minjung” theology among some Protestants, that emphasized democracy and freedom during the dictatorship, it was only preached in a minority of churches. The question remains about how relations between South Korea’s religious factions will continue. Protestants remain a powerful conservative force, picketing LGBT Pride events, demonstrating against North Korea, and even protesting against the introduction of halal meat in some stores, a move meant to attract tourists from Muslim countries. In 2009, some evidence for evolution was removed from high school science textbooks because of pressure from religious groups, and a full third of Koreans – more than the number of Christians – do not believe in evolution. Former President Lee Myung-back was criticized by Buddhists and the non-religious for stacking his cabinet with members of his own church, Somang Presbyterian, where he is an elder. Current president Park Geun-hye is an atheist, but her conservative power base relies on Christian support. Evangelical zeal to send missionaries to places most others would never go – including Afghanistan, Iraq, Jordan, and Yemen – have caused headaches for the government. In 2007, after ignoring the government’s advice, 27 Korean missionaries to Afghanistan were kidnapped by the Taliban, and two were killed. In 2009, the Korean foreign ministry warned Korean Christians to stop missionizing in Arab countries, fearing it was making Koreans terrorist targets. But to the casual visitor, Christianity hardly appears to be fading. Standing near the steps of the same church, Park Ki-min says that Christianity for him is not about material wealth, or creating a business network, or boasting about the size of your congregation. Dave Hazzan is a Canadian freelance writer in Korea who has written extensively about Korean society and culture. He has been published in VICE, Korea Herald, Korea Times, among many other out publications.